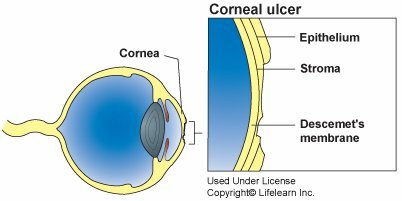 What is a corneal ulcer? The cornea is the transparent outer membrane that protects the front of the eye, including the iris (coloured part of the eye). The cornea is made up of three layers of highly specialised skin cells. A superficial sore or scratch on the outermost of these layers, the epithelium, is called a corneal erosion or corneal abrasion. A corneal ulcer is a deeper erosion that goes right through the outer layer and into the middle layer, known as the stroma. A corneal ulcer is diagnosed when deeper layers of the cornea are lost, and they can be classified as either superficial or deep. What are the symptoms of a corneal ulcer? In severe cases, corneal ulcers may rupture, causing a discharge of pus and/or blood to extrude from the eye. What is the cause of corneal ulcer? There are many possible causes of corneal ulcers, the most common of which is injury to the eye surface, for example, from a scratch by another animal, or trauma from a foreign object entering the eye (stone, stick, etc). a blunt trauma, such as rubbing the eye on the carpet. A foreign object remaining under the eyelid. Endocrine diseases such as diabetes mellitus, hypothyroidism, Cushing’s disease (hyperadrenocorticism). Genetic predisposition: Some breeds of cat, particularly those with short faces, such as Persians and Himalayans, are more susceptible to corneal ulcers and some dog breeds, particularly those with short noses, flat faces, broad foreheads and prominent eyes, are more inclined to corneal ulcers. 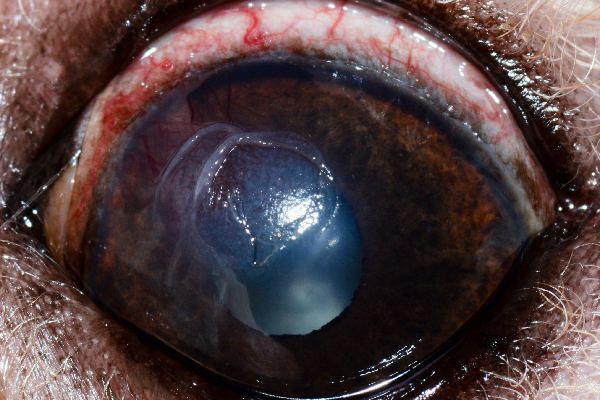 Boxers are particularly prone to severe corneal ulcers. Animals at greater risk are those that are extremely excitable, are prone to fighting, are used for hunting or spend periods of time in heavy brush. How is a corneal ulcer diagnosed? If you observe any of the signs and symptoms described, you should immediately take your pet to the veterinarian, who may refer you to an eye specialist, depending on the severity of the condition. Possible complications of corneal ulcers are the increased risk of eye infections, scarring and even blindness. The vet will carry out a thorough ophthalmic (eye) examination. Some ulcers can be seen without any special tools – they look like dull depressions on the outer surface of the eye. Deeper ulcers may require the application of fluorescein dye to the eye in order to be observed. The insertion of diagnostic dye into the eye is one of the most common and effective tests for corneal ulcers. A drop of this dye is placed on the cornea, where it will turn green and adhere to any areas of damaged tissue and ulceration, allowing the vet to assess the size and depth of the ulcer. If the ulcer is very small, special filters and lights may be used to enhance it. If it is very deep, or is a chronic condition, samples may be taken for culture and analysis before further use of fluorescein or other medication. Additionally, the vet may perform tests to rule out possible alternate conditions. These may include blood tests to eliminate any viral infections, or taking samples to be cultured for bacteria and fungi, to rule out conjunctivitis. They may also measure eye pressure to rule out glaucoma. What is the treatment for corneal ulcer? Treatment will depend on the severity, cause, size and depth of the corneal ulcer. In all cases, the prognosis is good on the condition that diagnosis and treatment are undertaken as soon as possible. If treatment is delayed, there is an increased risk of bacterial infection of the eye, which can result in permanent scarring to the eye and possibly blindness. If the corneal ulcer is superficial, surgery will probably not be required. 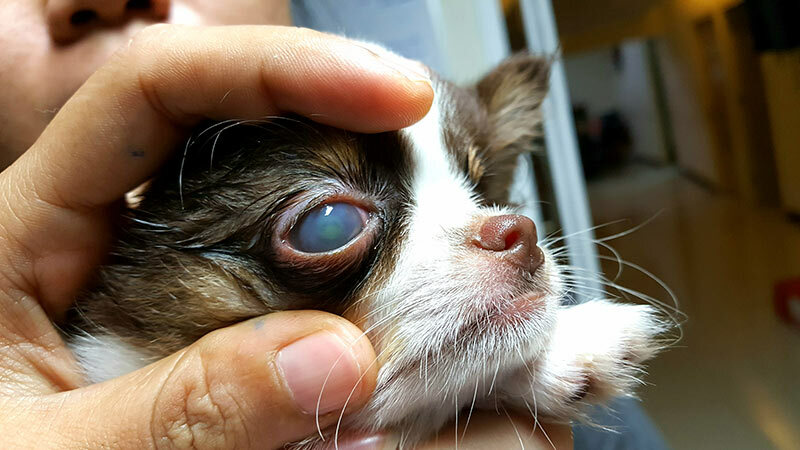 The vet may use a cotton swab to remove loose layers of the cornea. A superficial ulcer of the cornea should heal in around one week. Topical antibiotics and other medications, for example to stimulate tear production, will most likely be prescribed. Other medication may be prescribed for pain relief and inflammation. In some cases, special contact lenses may be inserted as an alternative to surgery, for the purpose of reducing eyelid irritation. Your pet’s activity may be restricted, and a collar may be used to prevent clawing at the eyes. Depending on the cause of the corneal ulcer, more extensive topical treatments may be used before resorting to surgery. These may include strong antibiotics, anti-fungal medication or even “autogenous serum”, which is specially prepared from a sample of the pet’s own blood. If the problem persists, surgical treatment will most likely be undertaken. Surgery may be required if the ulcer is more serious, deep or is growing, in order to remove the damaged or poorly healing tissue of the cornea, or to perform a corneal graft. Surgery will be followed by treatment with medication such as topical antibiotics and pain medication. A contact lens and bandaging may also be used to facilitate healing. Limit your pet’s activity during the treatment and healing period; a collar may be used to prevent clawing at the eyes. The cornea should be repaired around two weeks after surgery. It is very important to strictly follow the treatment regime prescribed by your vet, otherwise simple ulcers can quickly become more serious. If treatment does not lead to healing within one to two weeks, it may be a sign of an underlying problem of the cornea, or another medical condition. The best way to assess if the cornea has healed is to repeat the fluorescein test. Your vet may repeat this test at regular intervals through the treatment period, depending on the seriousness of the ulcer and the progress of healing. Corneal ulcers can have many causes, the most common of which is injury to the eye surface, such as by a scratch or trauma from a foreign object (stone, stick, another animal, etc). Corneal ulcers can appear suddenly or slowly, although acute (sudden) onset is more common. They are one of the most painful eye disorders in both dogs and cats. Eyes with a corneal ulcer may look red, cloudy, swollen and watery. Your pet may keep the affected eye closed, rub at their faces and avoid bright light. They may seem lethargic and depressed, and they may lose their appetites and not act like themselves. Corneal ulcers, like all eye injuries, require prompt medical attention. Simple ulcers, if left untreated, can quickly become more serious, leading to corneal scarring and even blindness. Regular visual checks of your pet’s eyes will help with early detection. You should be particularly vigilant if your dog or cat is of a short, flat-faced breed. If you suspect that your pet is showing signs and symptoms of corneal ulcers, a visit to the vet is essential. If you diligently comply with treatment protocols, the prognosis of recovery is good.  *Please note, any pet insurance advice provided is general only.  Refer to the applicable Product Disclosure Statement for details of Bow Wow Meow Pet Insurance cover.